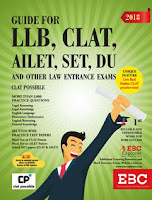 New Book on Booksnclicks.com for students appearing for LL B, CLAT, AILET, SET , DU and for all other Law Entrance Exams. Published by EBC well known publisher for Law Books. (You will not find this in any other book).